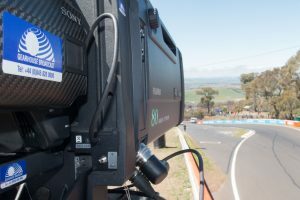 Gearhouse Broadcast, the Gravity Media-owned supplier of technical facilities, crew and services, delivered live 4K coverage of the Supercheap Auto Bathurst 1000 for Supercars. Marking the first time that an Australian sporting event has been televised live in 4K, it was used to launch Foxtel’s new 4K channel, 444. The largest Supercars round of the season was solely captured and delivered by Gearhouse Broadcast. The service included providing all the facilities, equipment and outside broadcast trucks on site at the Mount Panorama Circuit. By using Gearhouse Broadcast Australia’s extensive range of equipment, the ability to enhance to 4K from the traditional HD coverage of the 161-lap endurance race was successfully delivered. To make the event even more memorable, Supercars icon Craig Lowndes capped off a remarkable career with a seventh victory at his final appearance in the ‘great race’. Twenty-six Sony HDC-4300 and 1 Sony HDC-P43 were deployed around the track, while Sony’s HDC-4800 slow motion camera was used at the event to capture the action in even greater detail. This brought a total of 28 native 4K broadcast cameras. Then there were an additional 56 HD sources (speciality track cameras, pit cameras, Heli, CamCat – hi-speed rail cam system – and all the traditional EVS output channels), that were up-scaled through the 4K VMU. This amounts to a total of 83 sources available to the 4K Director to create a comprehensive 4K coverage of Supercars’ premier motor sporting event. The main programme output was been enhanced with native 4K graphics and a true native creation of 5.1 surround sound to accompany the brilliant and dynamic images, giving the viewing audience an unprecedented coverage of a live sporting event.